we welcome you to our space. Offering a collective of brilliant wellness practitioners who bring a refreshing perspective on health and vibrancy to the Blue Mountains & beyond. Think of us as your support team on your path towards your most radiant self. Our dual room wellness space located in a tranquil spot in the heart of Blackheath encompasses two rooms. Both simple, beautiful, organic spaces - one dedicated to all things Naturopathic, the other to modalities and practices to deepen the momentum of healing and provide holistic care. The clinic room has been created with the intention to offer clients high grade Naturopathic Care in a beautiful light airy setting. Owners Sarah and Eleanor span many modalities & weave their knowledge to bring forth positive health & wellbeing to the community. Bright and Balanced Living's Naturopath Sarah draws from her clinical wisdom as a Naturopathic, Herbal & Nutritional practitioner and utilises the extensive botanical & nutritional dispensary to deliver an expertly guided wellness experience. The womb room. This warm, serene, embracing space provides the perfect environment to experience nourishing healing modalities. 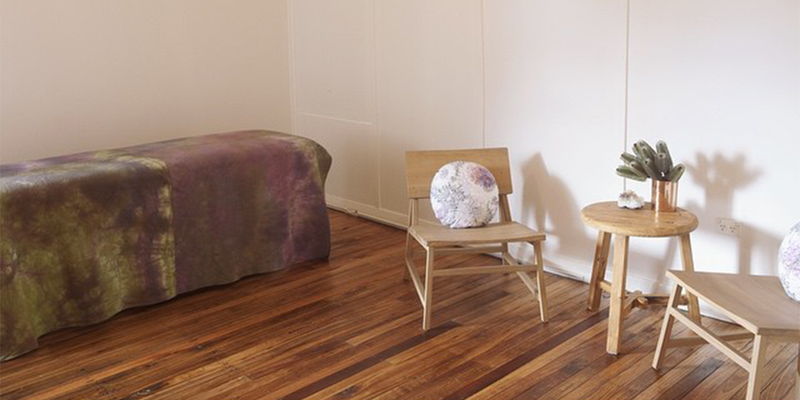 Dubbed the womb room for its cosy welcoming tone, this is the place for clients to release, unwind, find time reconnect, & above all to heal. We offer a deep range of massage, oriental techniques ,breathwork, counselling, energetic therapies & yoga to support your needs. Our team of highly diverse practitioners are honoured to support you. Sign up with your email address to receive news and updates from the Bright & Balanced team! We wholeheartedly respect your privacy.